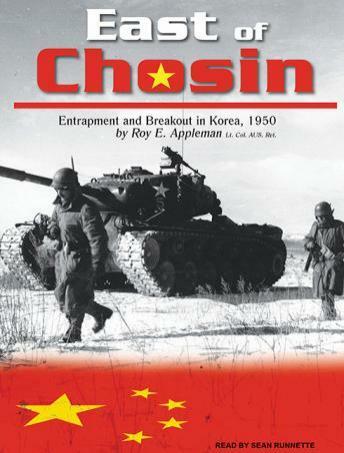 Roy Appleman's East of Chosin, first published in 1987, won acclaim from reviewers, readers, and veterans and their families. For the first time, there was one complete and accessible record of what happened to the army troops trapped east of the Chosin Reservoir during the first wintry blast of the Korean War. Based heavily on the author's interviews and correspondence with the survivors, East of Chosin provided some of those men with their first clue to the fate of fellow soldiers. In November 1950, U.S. forces had pushed deep into North Korea. Unknown to them, Chinese troops well equipped for below-zero temperatures and blizzard conditions were pushing south. With the 1st Marine Division on the west side of the frozen Chosin Reservoir, the army's hastily assembled 31st Regimental Combat Team, 3,000 strong, advanced up the east side of the reservoir. Task Force Faith in the extreme northern position caught the surprise Chinese attack. With rifles and vehicles often immobilized in the cold and snow, the task force struggled to retreat through a tortuous mountain gauntlet of enemy fire. With truckloads of dead and wounded trapped along the road, a few of the 385 survivors trudged across the frozen reservoir to alert the marines to their plight.